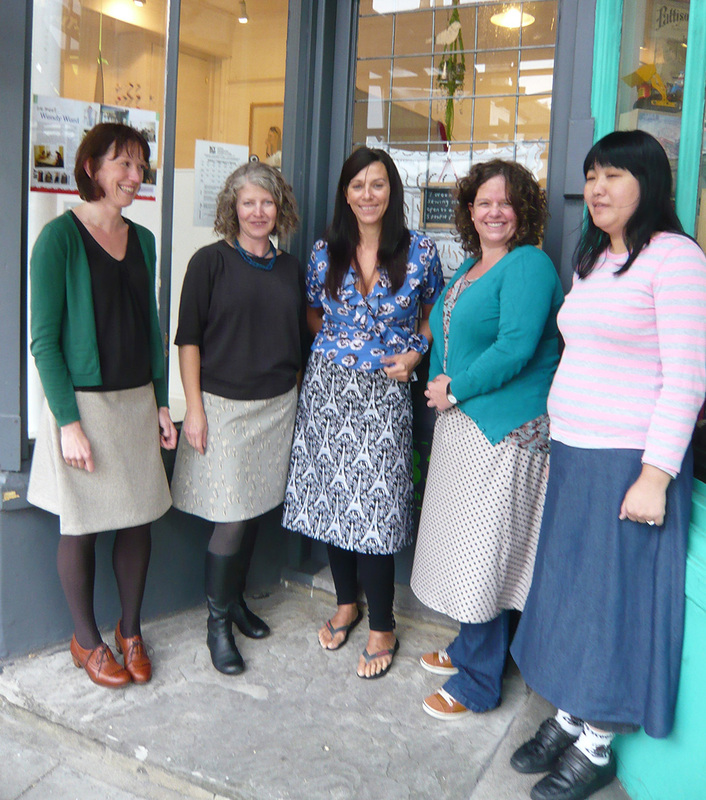 What a Brilliant Skirt Making Workshop! Yesterday was a super productive and successful day at MIY Workshop. I had five students for my Skirt Making workshop, who each turned up a little bit unsure, clutching bundles of lovely fabric that they were afraid of making a mess of. Six hours of focussed hard work later, look what they produced! Five perfectly fitting, finished skirts ready to wear home and to work the next day. From left to right, Romy in a very autumnal skirt in a beautiful soft wool from Ditto, Alison’s skirt uses a lovely floral print on a lovely quality cotton/linen fabric from Ray Stitch, Kerry made a lovely Parisian print skirt, Claire went for polka dots which will look great for work and Taruka used a soft lightweight denim. Three of these students have only just started sewing and these are the first garments they have made. I think they will be the first of many…! All five students seemed surprised by what they could achieve in a day and the standard of their finished skirts. I don’t know why, what else did they expect?! This skirt pattern will also soon be available to buy from MIY Collection. This entry was posted in Full Day Classes, MIY Collection Sewing Patterns, MIY Workshop, Sewing & dressmaking, Student work and tagged dressmaking classes brighton, easy sewing patterns, independent sewing patterns, learn to sew brighton, make an a-line skirt, miy collection, MIY Workshop, sewing classes Brighton, skirt making workshop, Wendy Ward. Bookmark the permalink.